Today we are featuring a wall mural that is available for purchase at Wallgazer. The mural, titled "Drugs Saved My Life," is the spirit of Prozac Nation embodied in wallpaper. Prozac Nation, written by Elizabeth Wurtzel and published in 1994, is a memoir documenting the author's struggle with depression. With the use of prescribed psychotropic medication, the author finds better living through chemicals, while still negotiating the demands of everyday life and dealing with the stigma associated with mental illness. 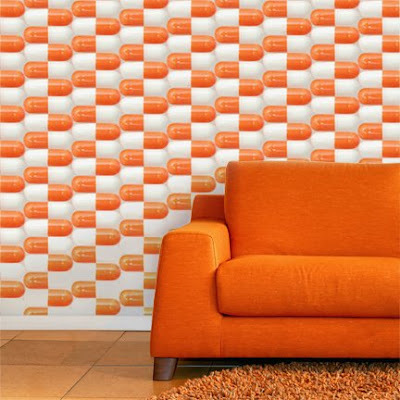 Our wall mural wallpaper featuring a pattern of slick orange and white pills is anything but depressing. And though the mural is colorful and vibrant, it still offers a less than light-heated commentary on modern society and our obsession with prescription medication. As with many of our original wallpaper designs at Wallgazer, "Drugs Saved My Life" is not only intended to be decorative, but also expressive. In keeping with our ability to further customize and personalize our wall murals, you can opt to have the pill colors changed to mesh better with your current decor scheme. Additionally, the scale of the pills in the mural can be altered to give you a collection of larger pills, or an even tighter pattern of smaller pills. Check out this and our other available Wallgazer wallpaper designs here!